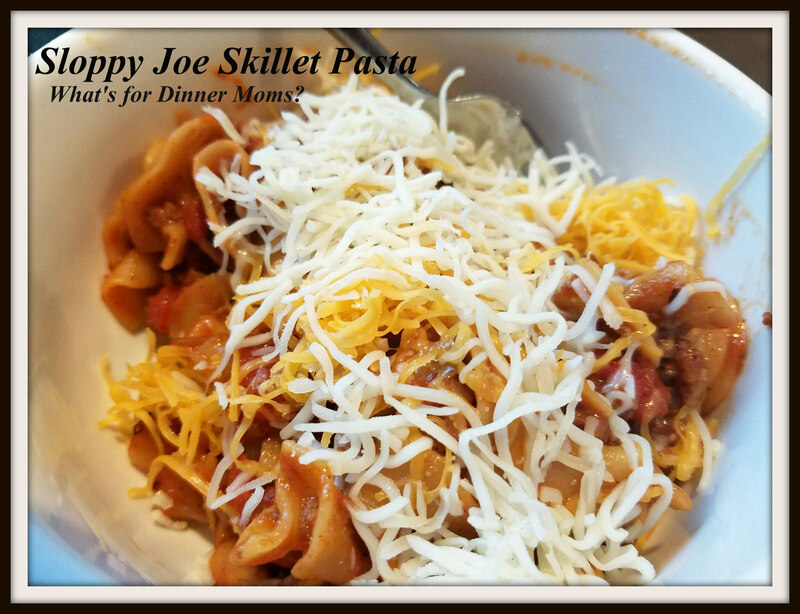 Sloppy Joe Skillet Pasta – What's for Dinner Moms? This has been a crazy month! With all we have had going on – 8 nights in hotels, graduation, an overseas trip for my son, a graduation party, dance recital, cello recital, doctors appointments, and physical therapy to just name a few things groceries are on the back burner. Besides this is the month we do our twice yearly clean out of our freezers. As of tonight I have one corned beef in the chest freezer and a few odds and ends like a loaf of bread and bread crumbs, and a few stray popsicles in the refrigerator freezer. I have the last ham thawing in the refrigerator to make this week to last the few days until we can get a few groceries. The freezers will be cleaned later this week to get them ready for all the wonderful berries, fruits, and vegetables coming into season. It is always great to start with a clean empty freezer. But, this dinner was the last of the ground beef. I had one and a half pounds left and needed to find something simple to make with it. 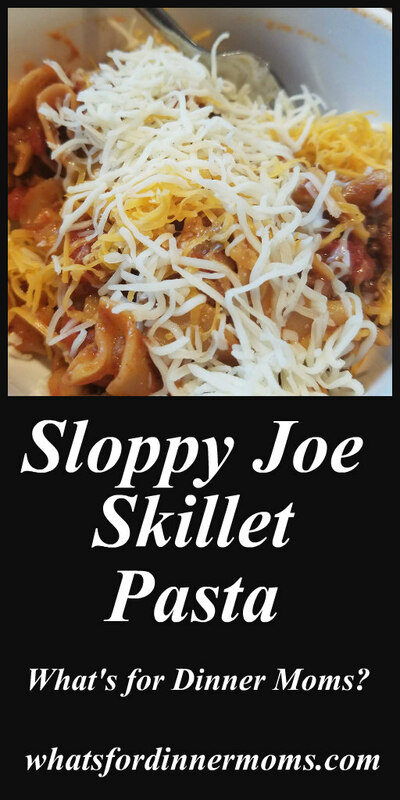 We love sloppy joes but not always the messiness of the sandwiches. Pasta works well to solve this problem while still having all the great flavors we love. This was a perfectly easy weeknight meal. It had lots of flavor (my kids LOVE vinegar) and it was super easy to clean up with only one pan. Served in bowls by kids loved this meal even more. I don’t know what it is but my kids seem to love meals served in bowls. Doesn’t change the meal any but they like bowls. Weird kids. I served this with a green side salad to complete the meal. In a large skillet over medium heat melt the butter. Add the onion to the pan and stir until it is translucent. Add the peppers, onions, and garlic to the pan and stir occasionally for 1 minute then add the ground beef and break it up with a spoon, stirring it all together. Allow to cook for 3-5 minutes, stirring occasionally, until browned through. Add the brown sugar, mustard, Worcestershire, chili powder, and paprika. Stir together and then add the ketchup and vinegar. Add can of tomatoes and stir well. Taste and adjust spices to your liking. Add egg noodles to the pan and cover. Make sure all of the egg noodles are covered with liquid if needed add a bit of water until covered. Cover the pan with a lid and let cook for about 5-8 minutes until egg noodles are cooked through. Stir well a few times during cooking. This is fun, easy and sounds delicious, Marci. Mmmmmm-mmmm, Marci! I am passing this recipe on to my family for sure. Yum! Love sloppy joes but don’t do bred, but we do eat gf pasta. Thank you for the ideas. This sounds really good. I made the Southern Potatoe Salad and it was a hit! Thanks for sharing! Nice one! Wow you are so busy! !